Canada India Foundation (CIF) Chanchlani Global Indian Award for 2016 was given to Dr. Subhash Chandra, Chairman of Essel Group at a glittering Gala held on April 22. This time it went beyond downtown Toronto, to the prestigious International Conference Centre in Mississauga. Premier of Ontario, Hon. Kathleen Wynne was the Chief Guest, while Navdeep Bains, Hon. Federal Minister for Innovation, Science and Economic Development was the Guest of Honour. High Commissioner of India to Canada Mr. Vishnu Prakash also graced the occasion, along with 500 prominent personalities from all across Canada. 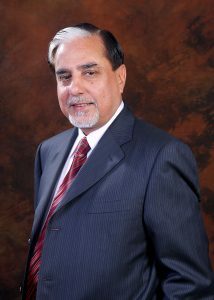 Mr. Subhash Chandra is a household name in India as he single-handedly revolutionized the television industry in India by launching India’s first private satellite TV Channel Zee TV in 1992. Today, his company Essel Group owns more than 70 television channels, reaching out to 959 million people in 169 countries globally. Chairman of a 30,000 crore rupee empire, Dr. Chandra also owns Theme Parks, Packaging Units, Multiplexes as well as daily Newspapers. He writes books and is a much sought-after motivational speaker. His TV talk show is now one of the most watched programs in India. Not content with just making money, he supports Ekal Vidyalaya Foundation, a Not for Profit organization providing education to almost 1.5 million children through 51,689 single teacher schools in rural India. Soon after the Gala, Dr. Subhash Chandra was elected to the Rajya Sabha (Upper House of Indian Parliament) from the state of Haryana on June 11, 2016.